Two major events a week apart in Honolulu underscored the urgent need for the community to address climate change -- and pointed to greater public engagement on the issue. From seniors to millennials, from educators to students, from artists to entrepreneurs, from enlightened for-profit businesses to nonprofits tackling the state's many critical needs, it is clear that people understand the threat to their very existence. They want an end to reckless denials of science and more decisive action on behalf of the community. On September 26, 2015 a packed Mamiya Theater, on the campus of St. Louis School and Chaminade University in Honolulu, heard poet scientist, Kealoha deliver his most significant work to date: The Story of Everything. This epic poem is a Community Inspiration Project sponsored by the Native Arts and Cultures Foundation. The multi-media, electric performance by the internationally recognized slam poet ran a good bit longer than planned--but the audience stayed mesmerized the entire time. Many remained for the conversation with the cast after the show. Key takeaway: fight climate change now, embrace earth-friendly alternatives to fossil fuels--or be complicit in destroying the planet. 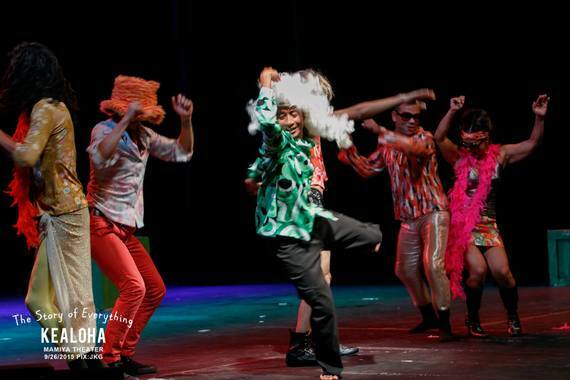 On Oct 2, at the Pomaika'i Ballrooms at Dole Cannery, there was no hop-scotch on stage, no strutting around in retro threads, no theatrical displays, and no dancing as there was at The Story of Everything. HANOCON2015 was not punctuated by the music of Taimane Gardner and the Quadraphonix, or the gorgeous visual spectacle of dances by Jamie Nakama, Jonathan Clarke Sypert, and Lorenzo Acosta, in collaboration with Wailana Simcock. 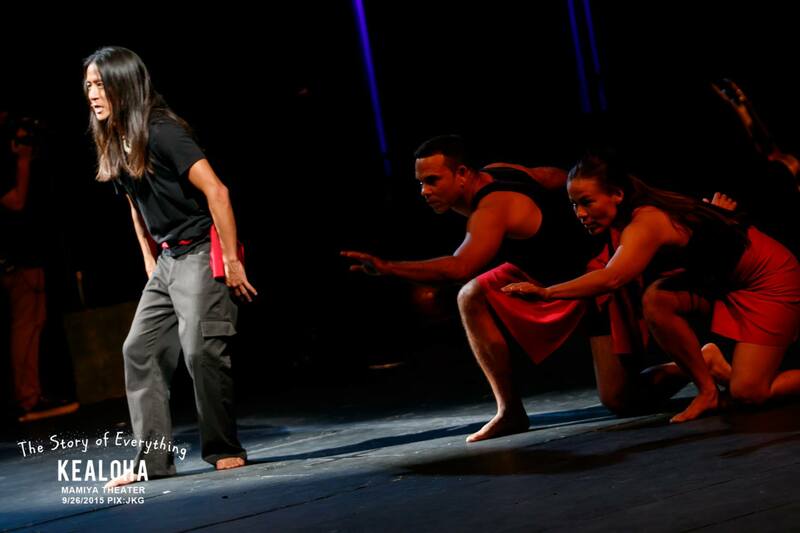 There was no recitation of the Kumulipo by Kaui Kanaka`ole, no display of the art of Solomon Enos on large screens as there was at the production co-directed by Cristian "See" Ellauri and Marc Bamuthi Joseph. 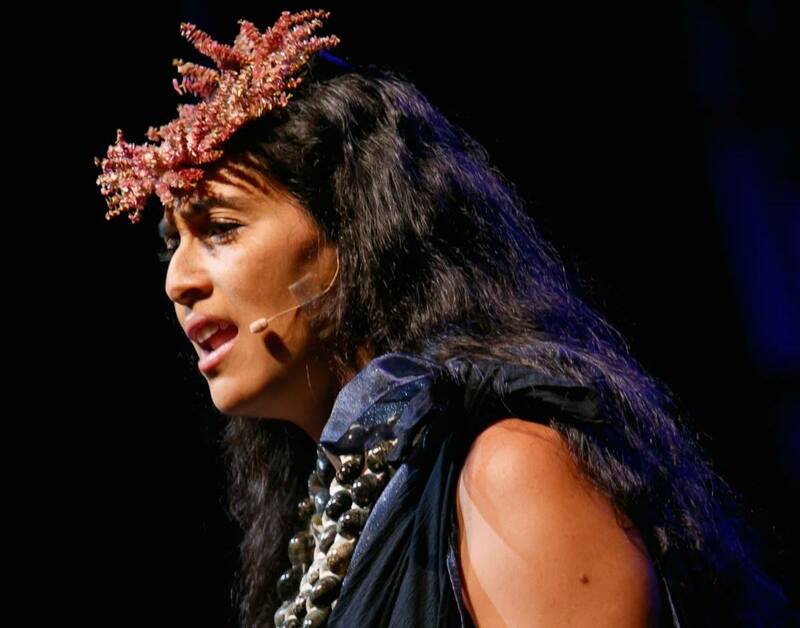 Layers of truth: Kaui Kanaka'ole recites the Kumulipo as Kealoha explains the science of creation. NACF President/CEO, Lulani Arquette, with poet scientist, Kealoha. All TSOE pix by James Kimo Garrett. 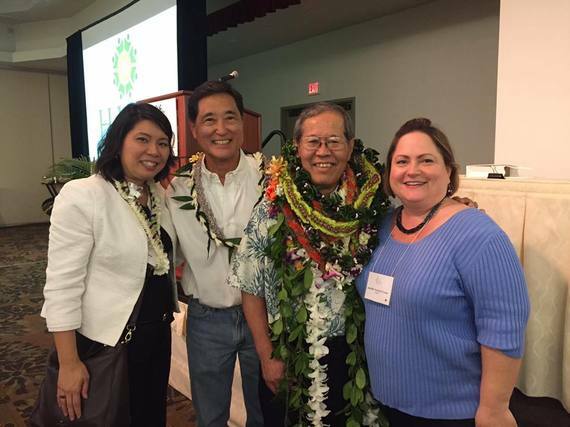 But, as surely as Kealoha, keynote speaker Dr. Kamanamaikalani Beamer , President/CEO of The Kohala Center, drew on his genealogy and the wisdom of his kupuna to make the case for modern solutions to climate change and community problems: solutions that are anchored in both indigenous knowledge and science. His speech "He'aina Waiwai: Reflections on Wealth and That Which Feeds Us," called for more mindfulness and respect for what the land gives us, and a reclamation of indigenous practices that once served us so well. Invoking Lao Tzu, Dr.Beamer cautioned that "if you do not change direction, you will end up where you are heading." 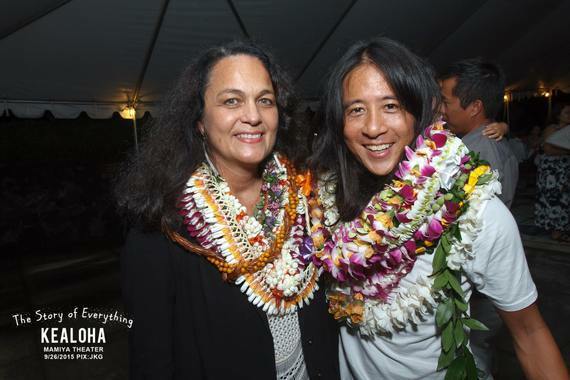 As Lisa Maruyama, President/CEO of HANO pointed out, the grandson of legendary Hawaiian educator and master of hula Nona Beamer, and son of slack key guitar master, Kapono Beamer, was very mindful of the legacy of his ancestors. He straddled the past and the present expertly, to talk about the future. He, too, issued an urgent call to address climate change or risk destroying ourselves and the only planet we call home. Kevin Chang, Executive Director of KUA, received the Emerging Nonprofit Leader award. Here (second from left) he wears his other hat as his band, Kupa'aina entertains HANOCON2015 attendees at the pau hana reception. HANOCON2015 attendees who had been at The Story of Everything would have heard echoes of Kealoha's impassioned poetry in Beamer's call to draw on ancestral indigenous wisdom and practices to build new models for a sustainable community. In a refrain that introduced each part of his interconnected explanation for the origin of humans, the poet sang: "Where do we come from no one knows/ But we do know a lot about everything though." One of the things we do know after these two events is that the wider community is becoming actively involved in the conversation about climate change and how we respond to it. Ordinary people trying to go about their lives recognize what some politicians refuse to, thanks to the deliberate, heavily financed efforts by fossil fuel companies to mislead the general public. The good news is the public gets it. Nothing we do matters if our very existence is under threat. 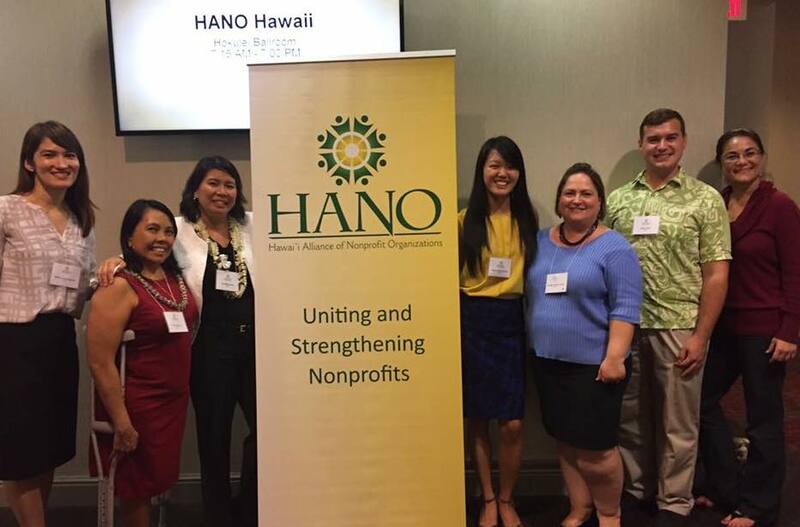 Lisa Maruyama (third from left) and the team behind the exceptional program at HANOCON2015: Helping nonprofits become more inventive and resourceful. One audience member asked if Kealoha would be taking The Story of Everything to Congress. That would have been a good question for Dr. Kamana Beamer too. He challenged HANOCON2015 attendees to ask how these islands were able to feed more people from what the land provided 250 years ago than we are able to do today. He applauded the often unheralded work of the many nonprofits who do so much with limited resources to address critical needs; to counter damage to our coastlines and our communities; to improve our health and ensure our long term survival. Brian Ezuka (second from left) offered a very helpful workshop on nonprofit compliance basics, and Allen Arakaki received a Lifetime Achievement Award at HANOCON2015. All HANOCON2015 photos courtesy of HANO. 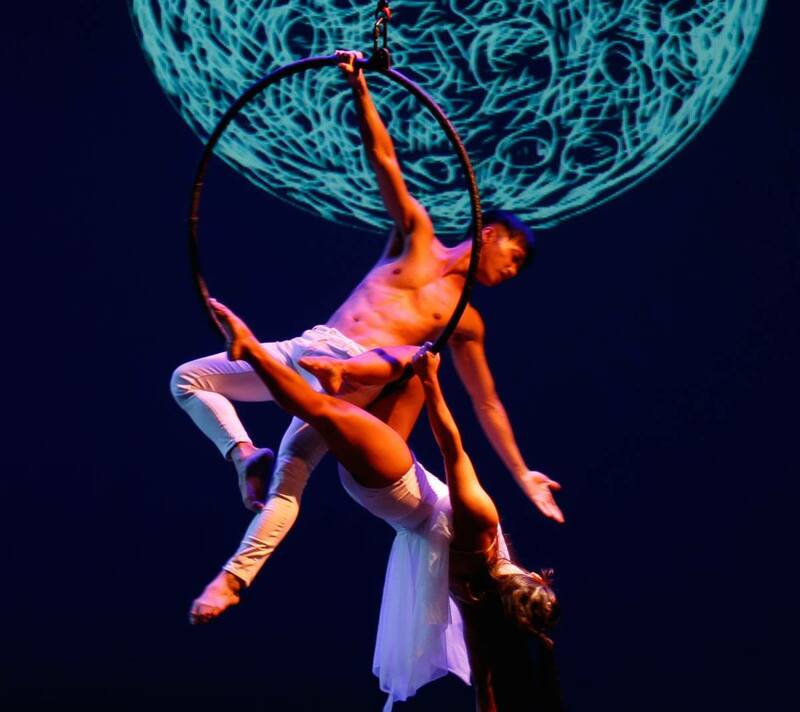 Whether you were at The Story of Everything or at HANOCON2015, you heard that the planet is our teacher. Listen to what it is saying. Heed its call. Or keep heading down the path to self-destruction. Fortunately, along with sounding the alarm, both the poet and the nonprofit visionary conveyed a great deal of their personal optimism that things can change, and will change. It is entirely up to us. We simply need to hold ourselves, and our civic and elected leaders accountable.